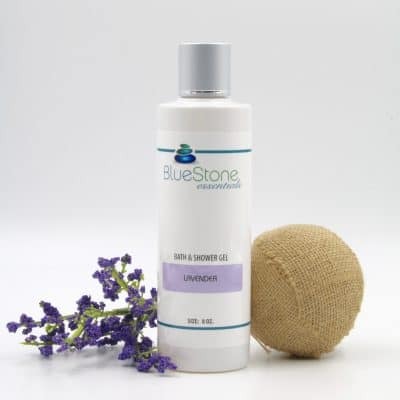 Enjoy a new shower and bath experience, uplifting your body, mind and spirit with Bluestone’s bath and shower gel. This Unscented Bath and Shower Gel offers coconut’s fine lather and long-lasting foam, and can be used as a shower gel, bubble bath or hand soap for gentle cleansing and care. It balances the oil production of the skin, benefiting both dry and oily skin, leaving it naturally beautiful and healthy. Made with Lavender Flower Water and Vitamin E.
Cruelty Free – No Petroleum Products, Parabens, Synthetic Fragrances, Parfums Botanical Parfums, Artificial Colors, Formaldehyde or Sodium Lauryl Sulfate. A luxurious shower gel that gently cleanses, richly lathers, botanically rich and is simply divine! Ingredients: Lavender Flower Water, Coconut Cleansing Complex (Ammonium Lauryl Sulfate, Ammonium Laureth Sulfate, Decyl Glucoside, and Cocamidopropyl Betaine), Aloe Barbadensis Leaf Juice, Vitamin E, Phenoxyethanol, Citric Acid, Passiflora Edulis Seed (Passion Fruit) Oil, Oryza Sativa (Rice) Bran Oil, Ethylhexylflycerin, Euterpe Oleracea (Acai Palm) Fruit Oil.